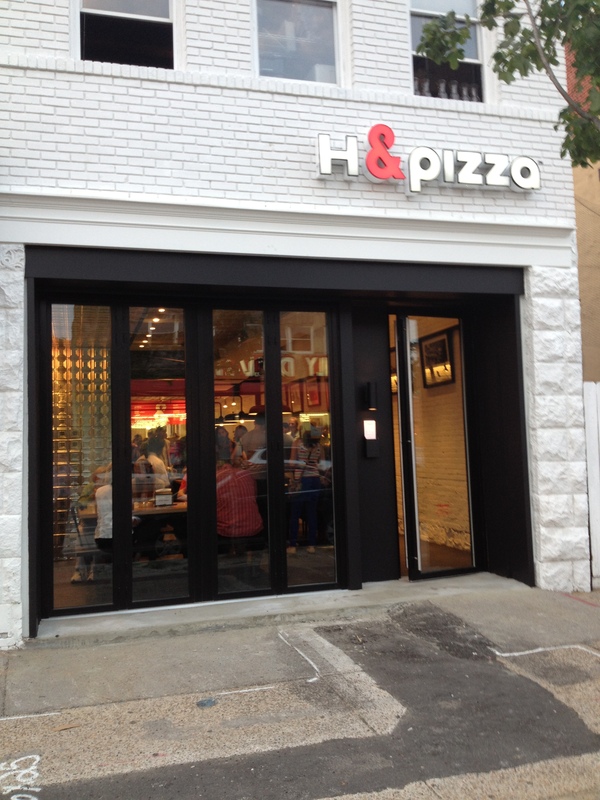 H&pizza (1118 H Street NE)–next to Taylor Gourmet on H Street–opens for lunch and dinner starting Friday, July 13th, but tonight they had a soft opening to debut their new restaurant and food (opening menu). 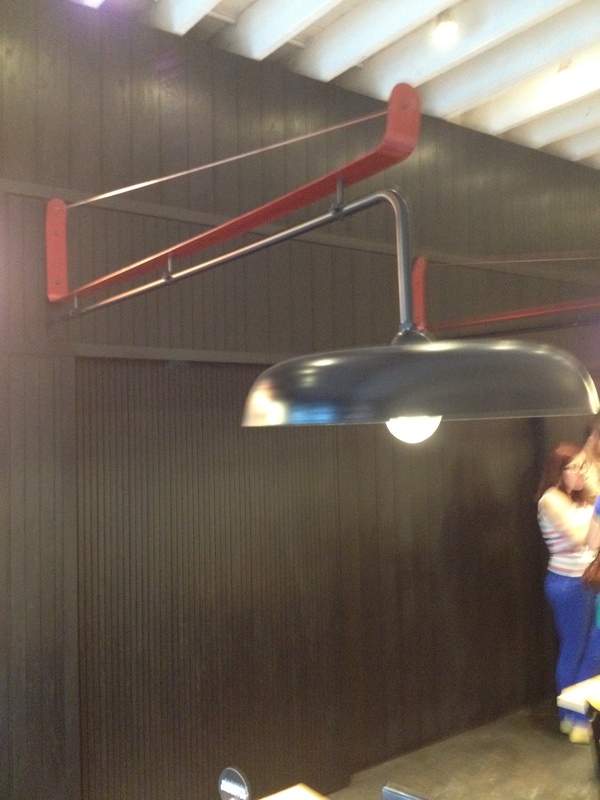 We were very impressed with both; the interior is completely rebuilt and redesigned from the previous tenant (Birdland) and the food was excellent. We were lucky enough to chat with the owners and the chefs for awhile and have very high hopes for the new place (you can see our previous interview with one of the co-owners for more background on the restaurant). Their goal is to allow you to make a fully customizable pizza that fits your tastes because you designed it (imagine a customizable assembly-line like a Chipotle). They have spent the past several weeks testing different sauces, doughs, cheeses, and ingredients in a test kitchen, and they offer a truly unique set of choices for your pizza (check out their opening menu here). In addition to letting you make your own pizza from scratch, they have several “Our Suggestion” pizzas that are predesigned by the owners and can be ordered right off the menu if you don’t feel like making your own. Once you’ve selected your toppings (or one of their suggestions), your pizza goes through their oven (90 seconds) and comes out ready for you to enjoy. The plan is for the whole process from ordering until when you get your pizza to take less than five minutes. 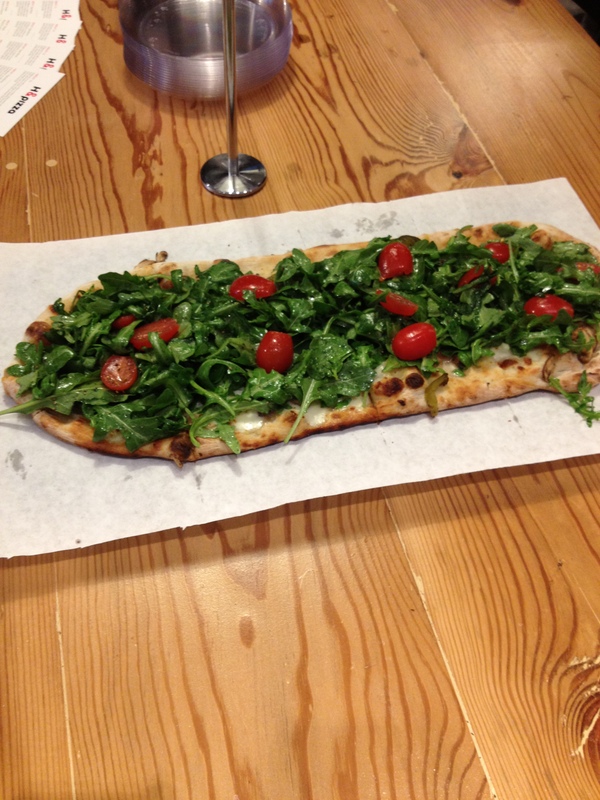 The pizzas have a long oval shape and are roughly the size of a large personal pizza. 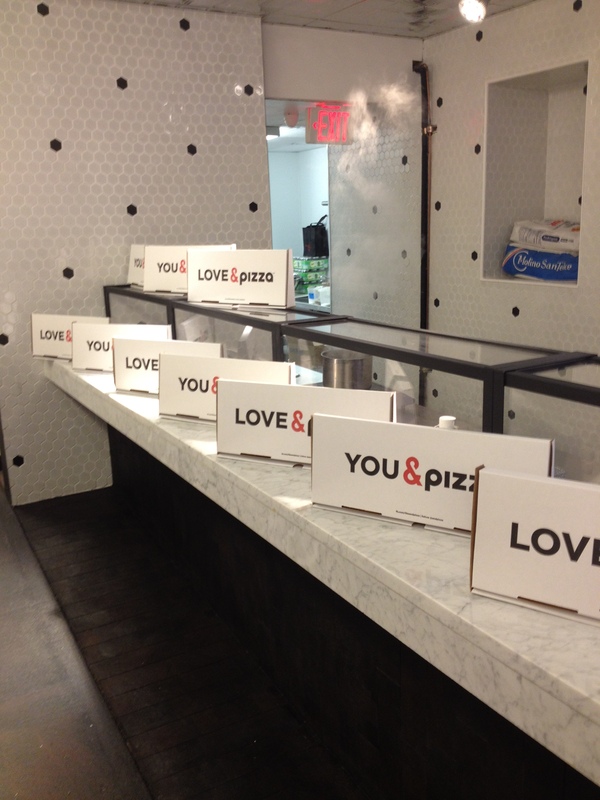 We tried all nine of the “Our Suggestion” pizzas and enjoyed all of them. Even though the pizzas cook very fast, the quality is not sacrificed at all as they come out cooked just right (and not burnt). Every pizza had a nice blend of fresh cheeses, ranging from mozzarella to goat to ricotta to asiago to provolone, that made each one stand out. Our favorites included Kiss &Fire–a spicy tomato sauce based pizza with provolone, ricotta, meatballs, mushrooms, and several dabs of a very tasty strawberry balsamic sauce that made it one of the most memorable (and tasty) pizzas that we’ve ever had. 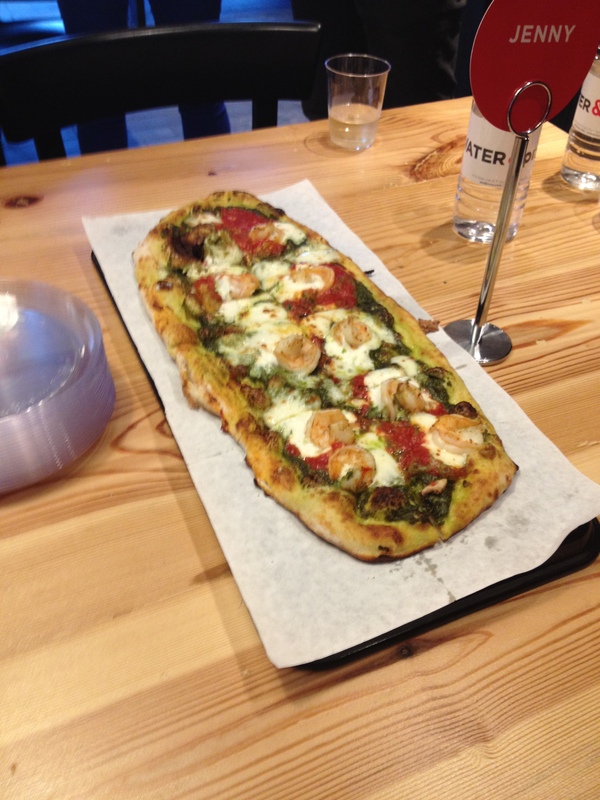 Another favorite was the Jenny–a pesto based pizza topped with large shrimp, ricotta, and mozzarella. The pizzas are very reasonably priced: $6.82 gets you a pizza with your choice of dough, sauce, and one cheese and $8.64 gets you an unlimited topping pizza. H &pizza will have a selection of wine and beer that will rotate and also has a soda fountain with its own line of sodas (we very much enjoyed the cherry cola and the orange soda). 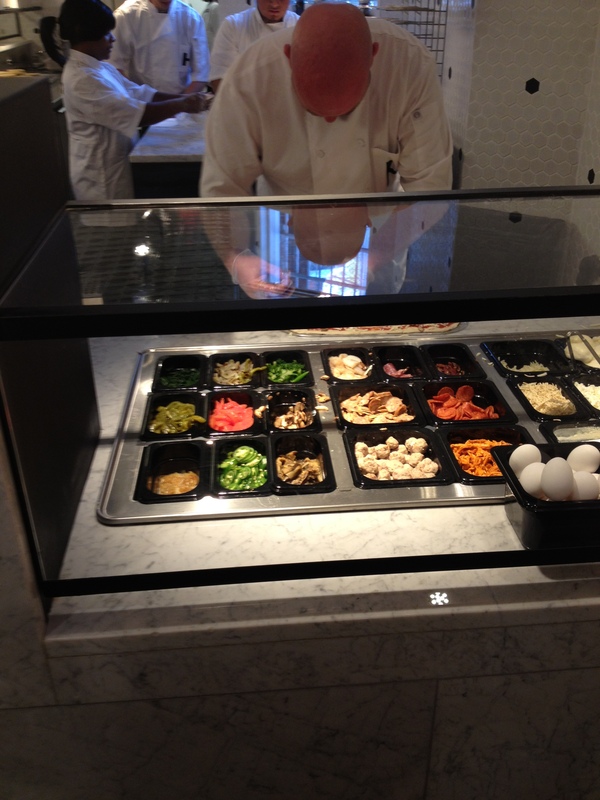 In addition to lunch and dinner in the restaurant, H &pizza hopes to do a swift takeout business as well. The interior has been completely redesigned to have a new modern look. 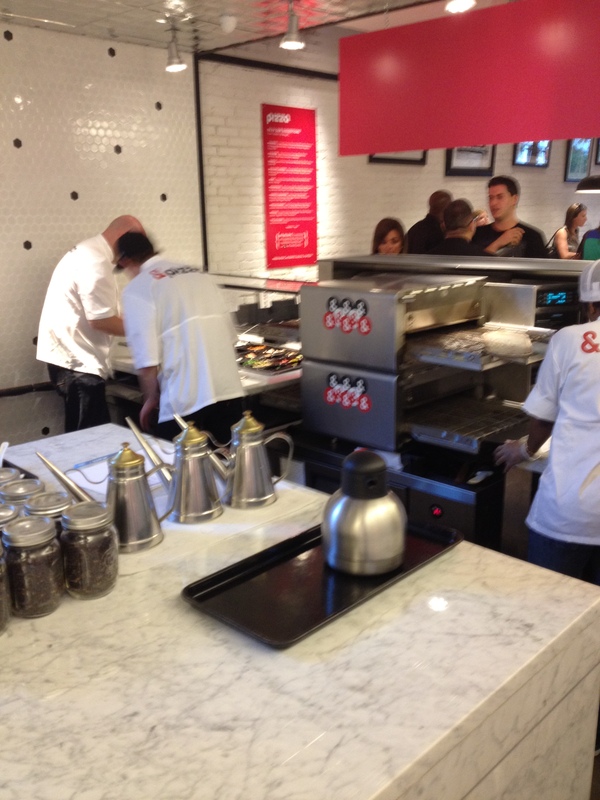 As you enter the restaurant you walk past the seating area to the ordering counter and assembly line. 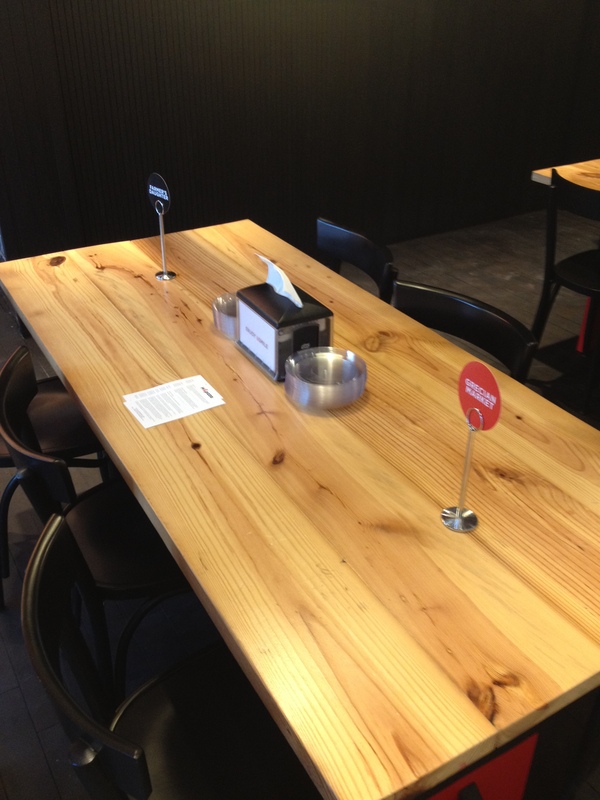 The restaurant has seating for approximately 30 people at 6-person wooden tables. There are also several bar style seating spots that will overlook the kitchen and pizza assembly line (see picture above). The interior has a very friendly feel and should do well for both lunch and dinner as well as the late night H Street crowd. 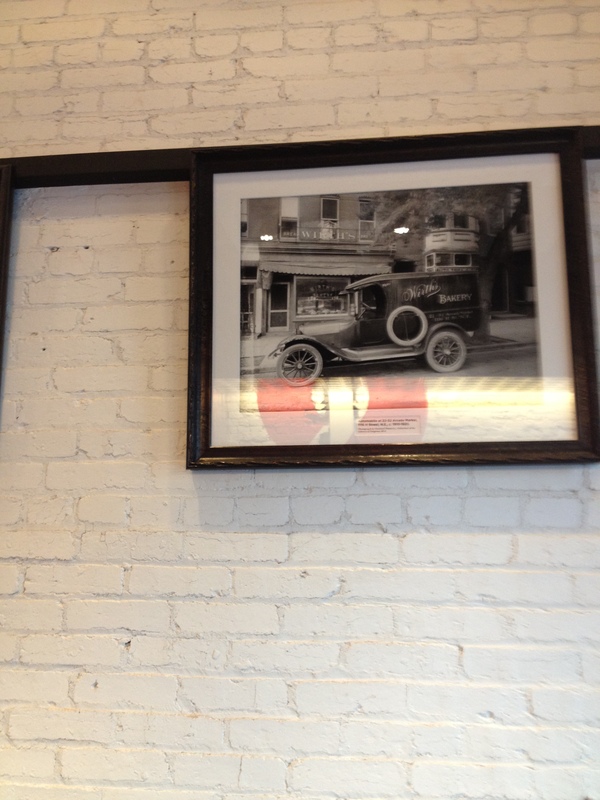 The restaurant features dark floors and the wall to the left is black while the wall on the right is painted white and has several historic photos of H Street hanging from it (the owners were able to track down the photos the District Department of Transportation and the National Archives). 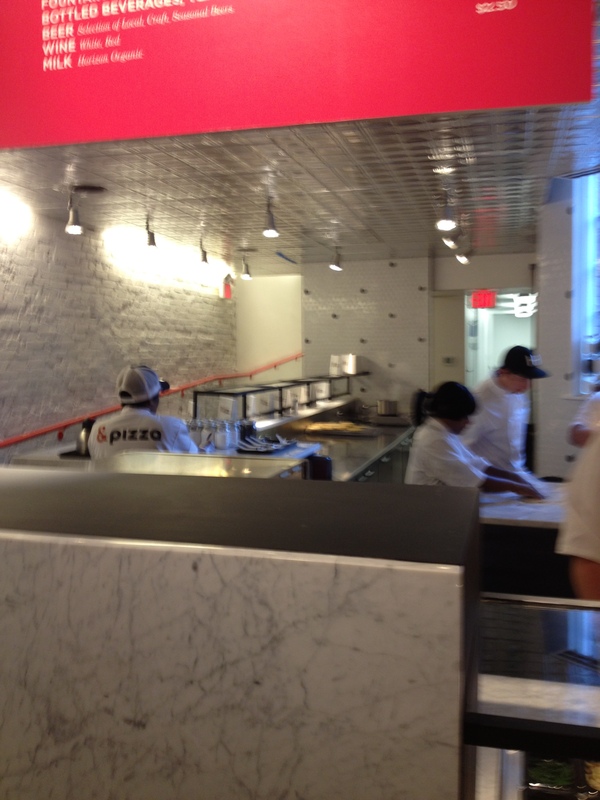 The management team at H&pizza seems very attentive to detail and driven to make the restaurant succeed. That combined with a great looking restaurant and stellar pizza should make H&pizza succeed on H Street. 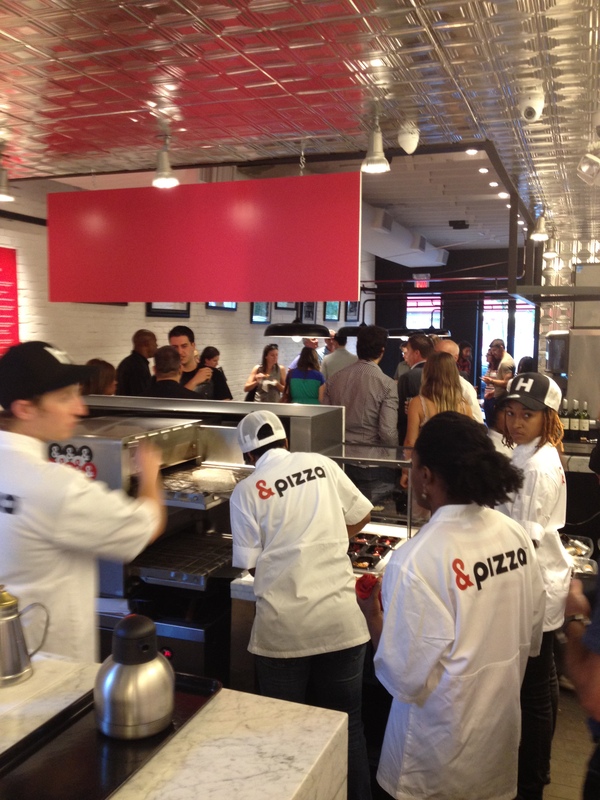 If they succeed, we think that we can expect to see additional &pizzas around town in the next few years. Any idea how kid friendly itll be? High chairs? I went one time the pizza was great, can’t wait to go again. Just had some of this during my visit to DC last weekend. Amazing!